Ivory Coast: "Wounded Patients Are Stable, But Their Problems Are Not Over"
"There were so many patients, we had to stay in the hospital for two full days and nights. We operated around the clock, trying to stabilize the most serious cases." 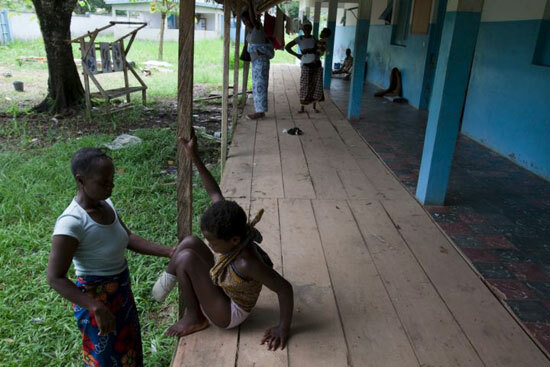 A young girl is helped by her mother at MSF-supported Bangolo Hospital. Her foot had to be amputated after it was too badly damaged by bullets to be saved. She was fleeing the fighting in her village when she was shot. Hundreds of people died and hundreds of others were seriously wounded during an outbreak of violence that occurred in the Duékoué region of western Ivory Coast between March 28 and 30. A Doctors Without Borders/Médecins Sans Frontières (MSF) surgical team treated many of the war wounded at nearby Bangolo Hospital, following a disaster plan MSF developed for such an occurrence. Dr. Martial Ledecq, the MSF surgeon in Bangolo, describes what happened. I arrived in western Ivory Coast on Sunday, March 27. On Monday morning, we were still getting ready when the first wounded patients arrived. The March 28 major offensive had just begun. The first to arrive were lightly wounded—those who were able to get to the hospital on their own. Then two large trucks arrived, carrying many patients. We realized how important our disaster plan was, which MSF had developed more than two months previous. Thanks to the plan, we were able to triage the slightly wounded and the more serious cases. There were so many patients, we had to stay in the hospital for two full days and nights. We operated around the clock, trying to stabilize the most serious cases. Despite our intensive care and surgical care efforts, two people died. With the tensions in the region, nearly all the medical and administrative staff had fled Bangolo Hospital. When the MSF team arrived, an (Ivorian) doctor, anesthetist, and four nurses had remained. But in Duékoué, where the conflict was extremely severe, the hospital was practically non-operational and no surgeries could be performed. Bangolo Hospital was thus an essential resource for operating on the wounded. We treated nearly 150 wounded patients over the course of a week. A good number of them had minor wounds and did not need surgery. Most of the patients we treated arrived at the hospital several days after being wounded because they had stayed hidden in the bush. These older wounds create problems in terms of secondary infections. War surgery involves cleaning the wound to remove all dead tissue and, in particular, immobilizing fractures that will take months to heal, if they heal at all. Today, all the wounded patients are stable. They no longer have fevers and they can get around. But their problems are not over. Their treatment, of course, requires very specific and precise surgery. But many people received gunshot or machete wounds or were beaten. They saw one or more family members killed and their villages burned. They all lost their dignity. At times of such brutal violence, the value of a human life dissolves. During such a period, people don't come to each other's aid, the state of law no longer exists, and neither do justice and fraternity. People feel humiliated by their wounds. That's why we have to help restore patients' dignity, in addition to providing surgical care. We do that through simple human interaction. We say, "hello", "what is your name?" "have you eaten?" "have you slept?" "tell me what happened". That attitude is contagious and, little by little, it spreads throughout the hospital. At Bangolo Hospital, I can see and feel the Ivorian staff and the patients gradually recover the human values that were scorned by the violence that occurred.